The trillion-star Andromeda galaxy, the focus of a new, student-run project called the Trillion Planet Survey, which aims to find signs of alien life. An ambitious, student-run hunt for intelligent aliens is underway. "Second, we assume the transmission wavelength of this beam to be one that we can detect," Stewart added. "Lastly, we assume that this beacon has been left on long enough for the light to be detected by us. If these requirements are met and the extraterrestrial intelligence's beam power and diameter are consistent with an Earth-type civilization class, our system will detect this signal." That system employs an image-analysis pipeline and the global network of small (1-meter-class, or 3.3 feet), robotically controlled telescopes operated by the Las Cumbres Observatorye. Each telescope by itself captures a roughly 3 percent slice of Andromeda, which lies about 2.5 million light-years from Earth. The team will combine a set of these photos to create a single image, which will then be compared to a pristine "control" photo of the galaxy — one unsullied, for example, by satellites passing overhead. Any differences between the two images could theoretically result from light signals produced by E.T. (though there could of course be natural explanations as well). Such "transients" will be processed by the data pipeline, which will help weed out false positives, team members said. "One of the things the software checks for is, say, a satellite that did go through our image," Kyle Friedman, a senior from Granada Hills Charter High School in Los Angeles, said in the same statement. "It wouldn't be small. It would be pretty big, and if that were to happen the software would immediately recognize it and throw out that image before we actually even process it." Stewart, Friedman and their colleagues are in the research group of cosmologist Philip Lubin, a professor of physics at the University of California, Santa Barbara, who has a lot of space-laser experience. And Lubin has previously proposed looking for signs of "directed energy" spaceflight systems that E.T. might be using. A still from a video shows how an array of Earth-based lasers would propel a sail-equipped "nanocraft" to a distant star system in the Breakthrough Starshot program. If intelligent aliens have also developed such spaceflight systems, the beams they're projecting out into space could be detectable, researchers say. 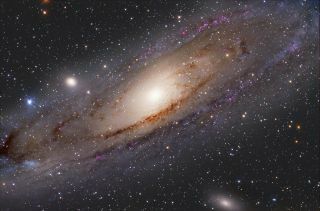 The Trillion Planet Survey is already observing Andromeda and getting the project's pipeline ready to go, team members said. The image analysis may be complete in just a few weeks, but similar observations could continue to be made indefinitely, so the researchers can hunt for signs they may have missed. For most of the 60-year history of the search for extraterrestrial intelligence (SETI), researchers have hunted for radio signals. The new project is an example of a newer strategy known as optical SETI, which Trillion Planet Survey team members said should work in concert with the traditional method. "In no way are we suggesting that radio SETI should be abandoned in favor of optical SETI," Stewart said. "We just think the optical bands should be explored as well."